The Ja Morant hype has hit a new level. A day after the Murray State star put together a stellar 17-point, 16-assist, 11-rebound performance in leading the Racers to a decisive victory over No. 5 seed Marquette -- the first triple-double in the NCAA Tournament since Draymond Green in 2012 -- the coach of his next opponent likened the 6-foot-3 star to transcendent passer and Hall of Famer Magic Johnson. "What I notice is he's one of the most exceptional players that I've had a chance to watch play," Hamilton told ESPN on Friday. "He's kind of a throwback to guys who have the ability to score points. But [he] also has the passion and the excitement about creating opportunities for his teammates, guys like a Nate Archibald who can lead the NBA in scoring and lead in assists at the same time. A guy like Magic Johnson, who got so much joy making the game easy for his teammates. Even a player like Muggsy Bogues, who has an uncanny way of making things easy for his [teammates]." Likening Morant, a sophomore who is still two years away from legally being able to purchase alcohol, to one of the top 20 players of all time is high praise -- even if it's only a comparison of the joy each plays with. And it's true: Morant is a different animal entirely. 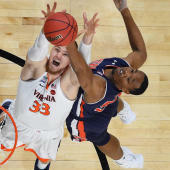 He gleefully whips passes one-handed across the court, attacks the rim with ferocity and plays with an energy and excitement that has invigorated the 2019 NCAA Tournament. Just how long will we see Morant's star brighten this March is the question. Murray State is a No. 12 seed and will enter Saturday against No. 4 seed Florida State as an underdog, but with Morant, the best player on either team, the Racers have a shot at advancing. Said Morant on Thursday: "I hope they can really see, not me, but that Murray State is a great team and we can run with the big dogs."